You might think that the human eye tells us what the world really looks like, but we are literally blind to much of what surrounds us. A whole Universe of colour exists, and we can only detect a thin band of it which we call the spectrum. You probably recognise some of the names of the energies of light that our eyes cannot see; radio, microwave and X-rays. The entire range of energies of light, including both light we can see and light we cannot see, is called the electromagnetic spectrum and you can see an image of it below. The Universe is emitting light at all different energies but since we can only see visible light, we are put at a disadvantage. 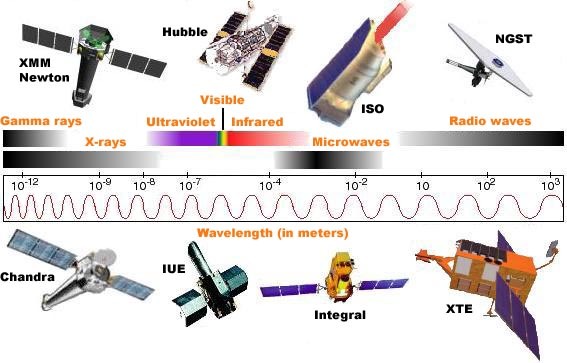 With the advancement of technology, we have been able to build instruments that detect many of these different energies of light, enabling us to better understand the Universe surrounding us.